One of my New Year's Resolutions was to write for at least 20 minutes a day, every day. i kept that up until late March and then got distracted. What was i even writing during those 20 minutes per day? 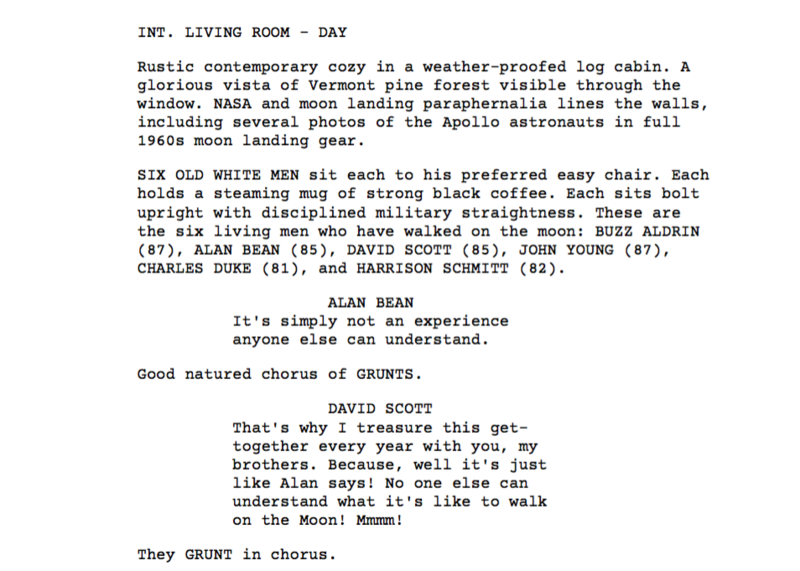 Was i writing actual script pages? Naw man, i just wrote outlines and treatments and snippets of dialogue here and there. i didn't write many scenes in screenplay format because that was too much pressure, and early on in the process it was sooo important to keep the pressure ultra gentle, as one might handle a little baby. Some days i would wake up with a couple great ideas and write effortlessly. Some days i wrote a few paragraphs about how i'm a bad writer and not funny and my ideas are bad and my writing is very very bad which also succeeded in taking the pressure off. Now it's fun to look back through the crazy directions i've explored. Up until recently i structured the narrative around Goldilocks and the Three Bears. i wrote about a life extension cult that eats massive communal meals of alfalfa and outsiders refer to them as “Leaf Heads.” i gave my fictionalized mom a pet cow — that one is still with us. Margaret Rose the pet cow survived the Great 2018 Culling of Wacky Ideas. i had a storyline about the surviving men who've walked on the moon and they hold an annual meet-up where all they talk about is walking on the moon. i cut down the crazy not because i feared it but because it distracted from the core arc. i'm fond of each weird tangent (my babies!) (special fondness for the one where Buzz Aldrin dates my fictonalized grandma) and i didn't kill them, i just set them aside for use on other adventures. At the beginning of this month i ended my sabbatical of distraction and started writing again. i gave myself a deadline: 100 pages of first draft by the end of July. And i set an ambitious schedule: write 10 pages of script per day for 10 days. Yahhhhhh WOW that process seems to really work for me! 100 pages came rull easy with a trusty treatment by my side and daily supportive comments from Sweet Vlad. Each set of 10 pages took me about two hours. Thus — with preparation — the whole 100 took 20.
i'm excited. If this process can be repeated for my other ideas, then i believe i've found the trick to get myself to Sit Down and Do It, which is one of the trickiest tricks of writing. my goal is to enter the polished SMOTHER into screenwriting contests next spring. i'm not interested in putting this one into production like i did with BLOGOB. This time i'm in it for the money. How lovely to write for money!